Marion Cotillard in "La Vie En Rose." A confession: I don't like divas. I especially loathe the self-destructive variety  the kind that sentimentally impressionable people are always writing books and making movies about. You know who I'm talking about  the pill-poppers, the drunks, the would-be suicides, all those Judys and Marilyns and Janis Joplins who emerge from their troubled childhoods into careers which revolve largely around making audiences wonder whether they'll actually show up for their performances. And if they do, whether they'll give something other than a pathetic play for our sympathies  which often enough involves our forgiving a sadly diminished voice or presence. This behavior is more than tiresome, because there is no reason to believe there's a real link between their troubles and their talents. An off-stage battle with booze or drugs doesn't necessarily add depth or soul to their performances. On the contrary, the history of show business is replete with sad stories that are redeemed by disciplined hard work. Plenty of stars refuse to trade on their hard-knock lives; they entertain us, not by forcing us to wallow in their miseries, but by causing us to forget our own for an hour or two. These reflections are occasioned by the arrival from France of La Vie En Rose, a biopic about the gifted, fragile and intermittently insane chanteuse Edith Piaf. Writer-director Olivier Dahan, has given her story a sumptuous production  with the look of an old-fashioned Hollywood musical sob story  as well as a maddeningly fragmented structure. For reasons best known to Dahan, he is always cutting from Piaf (played by Marion Cotillard) at the height of her relatively brief life (she was discovered in 1935 and died, at age 47, in 1963) to this or that aspect of her dismal past  her desertion by her mad mother, the years she spent in her grandmother's brothel (no, she was never a working girl, though that seems to be the only indignity she was spared), her time as a street singer, her rise to drug and drink addled international fame, her inevitable decline and early death from cancer. Considerable attention is paid to the great love of her life, Marcel Cerdan (Jean-Pierre Martins), the middleweight boxing champion, who died in airplane crash at the height of his fame and their love affair. But there is no rhyme or reason to this jumble  except perhaps to stress Edith's endless self-victimization. This lack of narrative coherence naturally has the effect of distancing us from her story. I guess Dahan thinks it really only has one point  her misery  and that it doesn't make much difference what order he presents it. 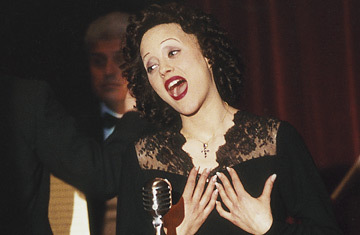 Cotillard appears to be as tiny as Piaf was (the singer was only 4' 8") and she acts neurasthenic as all get out, but somehow her constantly victimized state works against our sympathetic response, particularly since the film's random structure often robs us of cause-effect connections. Sometime an inner voice threatens to burst forth: "C'mon Edie, pull up your socks." That pretty much leaves us with Cerdan, radiating good nature and a casual pleasure in his own celebrity, to make us feel good for a few moments, and with Piaf's uncanny voice, still thrilling, still moving in her classic songs. It's easy to make us believe that her sad life conditioned the rueful timbre she imparts to her music. Maybe too easy. It's possible that her natural vocal quality was the one lucky accident in her unlucky life. Which, considering the fame, money and sympathetic regard she collected was not  considered from an objective viewpoint  all that unfortunate. All right, John Hard Heart has had his say. Maybe you will boo-hoo straight through this simple-minded, cheaply sentimental and unrelievedly lugubrious movie. Me, I made it to the long-delayed ending by shutting my eyes and ears to its dramatic passages and pretending it was a concert film. Sometimes my straying mind settled on the likes of Ella Fitzgerald and Anita O'Day, who must surely have had their troubles, but refused to wear them on their sleeves or on their bravely scatting tongues.